Anyone preparing their home for sale can get focused on all the little updates they need to make before it’s ready to be put on the market. However, once the property is listed, they usually just sit back and wait for the offers to roll in — which can be disappointing. Real estate agents know that the work never stops. Below are insightful tips from property experts to create buzz around your house and get it sold quickly! Most buyers do their preliminary searches online, so this will be their first impression of your place. Hire a professional photographer if your photography skills are lacking. Or, take it one step further and have a virtual tour video made — the extra effort might clench the deal. Just posting your home online might not be enough to attract buyers. However, if you give it a persona on Facebook or tweet about its beautifully refinished hardwood floors, you’ll reach more potential buyers and establish an emotional connection before they ever set foot inside. If the market isn’t cooperating with your current strategy, then be prepared to change it. This could mean dropping the price, hosting impromptu open houses or even taking the property off the market for a couple of months. Be sure to stay abreast of local selling trends by speaking with real estate agents and tracking area comparable. Enlist the help of all your friends and family to help spread the word. Put flyers out front and pass them around to all of your neighbors — they might want their friends to move in down the street. Also, let local real estate agents know your house is available. To get your home sold quickly, take the advice above from successful professionals who know that no effort is too small when it comes to the real estate game. If you’re getting ready to put your house on the market and would like more selling strategies, please call your trusted real estate professional. 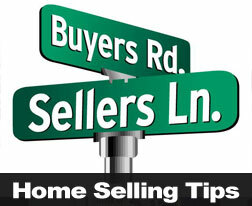 This entry was posted in Home Selling Tips and tagged Home Selling Tips,Real Estate Tips,Market Your Home. Bookmark the permalink.